Leaderboard is a new great feature of OnionBuzz plugin to engage your audience to spend more time on your website. Players are attracted to challenge each other, get higher score and lead the leaderboard. Players gain points playing Trivia (and Trivia only) quizzes. Because this is the only type of quiz in which you can get points. The total score of the player is the sum of points scored in all the quizzes in which he played. Player can improve his score if he scores more points in the quiz at any attempt. The best score is saved. Scores are stored permanently at this moment. Note: You can reset Leaderboard by opening analytics page of any quiz and click Erase all data button. Keep in mind that all statistics, including Leaderboard will be lost. Player answered correctly 20 out of 40 questions, which is 50%, which is 50 points. Go to Appearance/Widgets in WordPress admin sidebar. 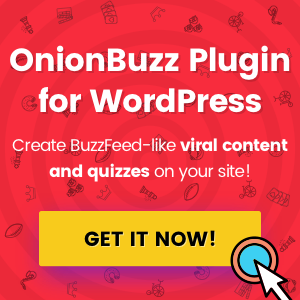 Add OnionBuzz Leaderboard widget to pages or posts where you want to display leaderboard. As simple as that! While setting up your widget It’s possible to optionally remove Anonymous players from rating. Plugin doesn’t create WordPress user accounts. All data for leaderboard and internal statistics are gathered from signed in WordPress users though. If user is not logged in, then he will be named as Anonymous. We recommend using free plugins like WordPress Social Login.